Help! I woke up this morning to find that something had completely dug up my peppers and tomato plants and eaten it all the way down to the peat pots. All this happened in a day and a half. The only surviving plant I had covered to minimize sun and prevent bleaching. I have never seen this before, what could have done this? How do I prevent it from happening again? You really have to tell us where you live before we can start guessing to expect any kind of accuracy. A hungry animal did it, what kind will be anyone's guess. You should consider fencing off your garden to keep animals out. You might need to bury the fence underground somewhat, depending on what animal you suspect. What kind of "cover" was sufficient to protect the plants? I live in south central PA. Weeds pulled were piled on top of the only surviving plant to protect it from the sun. The weird thing is that the plant, roots and soil were all eaten with weeds right next to them untouched. I have fencing I can use but if it's deer I might as well give up now. Nothing will keep them out. OK. Thanks for following up -- so ruling out anything 'unusual' (to me anyway) like armadillos.... are you saying the marauder was *attracted* specifically to your plants? That must have been heartbreaking especially if you had grown them yourself. To me -- in my personal experience -- it seems unusual for animals to go directly for the planted solanacea like tomatoes and peppers and even to dig them up. Deer I suppose would but only crop the top off I would think? In my garden, unprotected plants -- even unpalatable ones -- might be sampled by young rabbits but they would nip them off, spit them out and leave them lying on the ground. Pepper foliage is more likely to be eaten (my cats have been eating the leaves of the overwintered peppers in the house... then throwing them up ) but deer do eat tomato foliage. And I recently had a couple of my tomato seedlings eaten down to sticks and stubs by mice when I sprayed them with oil solution made with sunflower oil to treat them for mites. GroundHOG would eat the plant tops down to the stub, but I haven't had them go after tomatoes... maybe peppers, though. Would they DIG up the pots? -- were they loosely planted? Where there was nothing left, does it look more like the plants were PULLed up out of the ground, pot and all? (back to the deer theory). The ground looks awfully dry though LIKE there was some digging going on. Hm... were the seedlings very recently planted? Had they been previously watered or fertilized with some kind of organic fertilizer? Fish emulsion? But cats and dogs wouldn't eat the plants. That might encourage skunks, opossums, and raccoons to dig them up ...though I'm not sure raccoons would eat the tops. They are more likely to drag them off -- any remains further away? Ha. Gary350 mentioned recently that turtles/tortoises can be a pest that raid his garden... I wouldn't have thought of that, but will mention it here just in case. ...as long as we are still exploring possibilities -- does the scene look anything like a large bird like turkeys or maybe Guinea hens might have pulled up the plants, ate them and then took a dust bath? (Are there any in your area?) if you were in a warm area further south - or California - I would include peahens in the poultry list of suspects. But I'm not seeing bird sctrach marks/tracks at all in the photos -- ANY discernible tracks/paw prints in the vicinity? I had a small dogs once that I took care of just long enough to find it a home. Every time I planted a new plant in the garden that silly dog would dig it up. I don't know if the dog thought it was a game or if the dog knew that plant was not there yesterday it should not be here today. LOL. I was glad when that dog was gone. The dogs digging pretty much destroyed the plants there was not much left to find. Most plant eating animals will only eat the tops but rabbits will sometimes eat roots too. Rabbits are often selective about what they eat if the yard has lots of dandelions they go from plant to plant eating only the dandelions and ignore other plants until all the dandelions are gone then they start eating other plants too. Rabbits prefer young tender plants over older plants. I have had plants vanish over night I always figured it was some type of plant eater if only the top was gone. I have seen Robins peck my tomato plants off at the soil surface then fly away leaving the plants laying there, cut worms do that too but corn meal stops cut worms. It is helpful to know what each animal eats so you can rule out certain ones. I have had trouble with turtles eating tomatoes and squash but not the plants. If there are no tomatoes or squash available to eat then maybe turtles will eat plants? Turtles are like little bulldozers they can force there way under a chain link fence or tunnel under a fence or after many hours of trying finally climb over a tall fence. Your photos look like the work of a small digging animal not a deer. One thing you can do to learn what is eating and digging your plants is, plant more plants then smooth the soil as smooth as a sidewalk with a board or something flat 3 feet around the plants then you will be able to see foot prints of the animal that comes. Video camera would be nice if you have one. Make a list of all the animals in your area then 1 by 1 rule them out narrow it down to 1 or a few possible animals. Learn the habits of each animal and what they eat & when they sleep that helps rule them out too. Ground hogs and Racoons do not usually come near towns where they are lots of people, dogs, cars. Ground hogs are day time animals, Racoons are night time animals. Last edited by Gary350 on Mon May 22, 2017 11:33 pm, edited 3 times in total. What everyone has said. My two best guesses would be a dog that just likes to dig. Where I live in farm country we have very few animal pests, like raccoons etc, but I have to keep all my gardens fenced just to keep my dog from digging them all up. The other would be as applestar mentioned if you had fertilized with anything organic, especially fish emulsion or other fish products. Where I used to live we did have a lot of raccoons and feral cats. I quickly learned that I couldn't use any kind of fish products because the raccoons and cats would dig them all out looking for the fish. Cats wouldn't eat the dug up plants, but raccoons often would. Fencing works well and isn't as hard as you think. That previous location we had deer, raccoons, woodchucks, oppossums, etc etc. 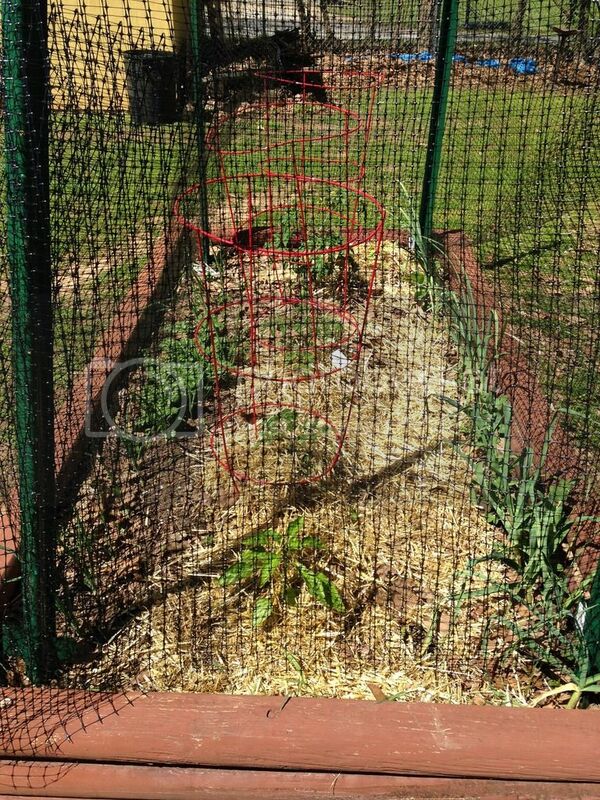 I just grew things in beds and fenced in the individual beds with deer netting. It is cheap and easy and keeps everything out. In the below picture The foreground square bed is fenced with wire rabbit fencing, but in the background you can see one with deer netting. Here's one with the netting. The netting just hooks to the stakes. When you want to work on the bed just unhook it. Earth staples keep it fastened to the ground. Deer can easily jump over a four foot fence, but they won't do it if that puts them inside a small enclosure, like my individually fenced beds. "Good fences make good neighbors." Keeping things fenced in is the way I can co-exist with my animal neighbors. I would share with them, if they would share with me. But I found out early on that raccoons and deer don't share. If they have a chance, they will eat EVERYTHING. I will second a thought for turkey. Visiting friends in Maine last year we watched a female turkey come in several days in a row and dig up a freshly planted row of berry bushes (I think blueberries, I don't recall), making a right mess of eveything. Curious! Ah ha! I zoomed in to look for tracks again and this time, spotted a feather in top right of the first, and bottom right of the 2nd photo!! White/light grey down with sort of reddish-tan colored tip short feathers. Does anyone know how to ID birds from feathers? Can't tell how big they are... what size was the peat pot? Well, my maurauders were the two legged kind. Someone stole my plants from my front yard. Some were cut off at the ground and others were pullled up by the roots. However, I have seen birds pull out seedlings before, but they did not eat the lettuce seedlings so much as pulled them up to get the worms on the roots. It is very possible a for a bird to make off with a plant, but it would have to be a pretty big bird to dig up a hole that size. ...so... @Froggy81, have you figured out the culprit yet? I'm very curious to find out now. applestar wrote: Ah ha! I zoomed in to look for tracks again and this time, spotted a feather in top right of the first, and bottom right of the 2nd photo!! White/light grey down with sort of reddish-tan colored tip short feathers. Does anyone know how to ID birds from feathers? Can't tell how big they are... what size was the peat pot? Thank you everyone for the input. I've been watching the area and there are definitely turkey In the area. I'm thinking bird of some kind. Btw, the feather is from my chickens. They've never gone after the garden before but can't eliminate it. A chicken was taken by the fox recently so stray feathers in the area is normal. Those of you who said turtle, I also can't eliminate that. I've seen a wood turtle very regularly within 30 foot of this exact spot. No remnants of plants or pots anywhere but my #4 lone survivor is still standing. I have about ten more to plant but was waiting to plant until I figured this out. I'm going to try the fencing that I have and see if it can hold out. At least long enough for the plants to take. I will update this if I get any news. At this point, I'm just thinking I need to plant and see what survives. Shanghaisky wrote: I will second a thought for turkey. Visiting friends in Maine last year we watched a female turkey come in several days in a row and dig up a freshly planted row of berry bushes (I think blueberries, I don't recall), making a right mess of everything. Curious! Not trying to offend any vegans here btw.